Long Non-coding RNAs (lncRNAs) refer to all non-protein coding transcripts longer than 200 nucleotides. Their critical roles in different biological pathways have been already well established. 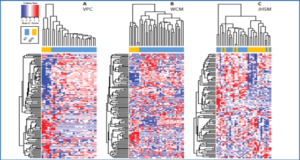 Altered expression of lncRNAs can be involved in the cancer initiation and/or progression. Since patients with hepatocellular carcinoma (HCC) are usually diagnosed in late stages, developing diagnostic methods seems to be essential. In this study, researchers at the Ahvaz Jundishapur University of Medical Sciences systematically analysed the expression levels of different lncRNAs in different genomic and transcriptome datasets. The analyses showed that SNHG6 is among the lncRNAs with distinctive dysregulation of expression and copy number variation in HCC tumors compared with normal tissues. The results also suggest that the dysregulation of SNHG6 is highly cancer type specific. Through co-occurrence analyses, they found that SNHG6 and its related co-expressed genes on 8q are involved in the structural integrity of ribosome and translation. This comprehensive in silico analysis, provides a resource for investigating SNHG6 in hepatocellular carcinoma and lays the groundwork for design of next researches.